Cherry Green Tea is full of character, full of flavour, and full of benefits, this Green Tea is a great choice for any occasion. Come rain or shine, this delightfully aromatic and enticing Chinese Gunpowder Green Tea is just waiting to evoke the spirit of summer. Be adventurous today and enjoy strong fruity notes combined with grassy overtones. And better still, frequently consuming this brew can actually promote healthy living! Yes, as strange as it sounds, Cherry Green Tea can improve cardiovascular health by lowering cholesterol, help you to lose weight by boosting the metabolism, and reduce stress by tasting great! Be part of something special today with Cherry Green Tea and see what all the fuss is about. And yet Gunpowder Tea still offers a “bang” of sorts, albeit in a very different way. Many believe that, when brewed, Gunpowder Tea (and, in turn, Cherry Green Tea) creates a crackling sound and as such, has been named accordingly. But this is just one theory. Another theory is that the overall appearance of Gunpowder Tea, which is made from tea leaves and young buds rolled into small, round pellets, resembles the lead shots used in muskets. We’ll probably never know for sure why Gunpowder Tea is called “Gunpowder Tea”. Why Cherry Green Tea is called “Cherry Green Tea”, on the other hand, is indisputable; its taste alone tells you everything you need to know. Tasting Notes: A potent fruity aroma wafts around the room long before you take your first sip. 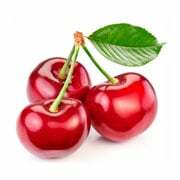 Enjoy sweet but subtle flavours of cherry with fresh, grassy undertones. Health Benefits: As well as lowering “bad” LDL cholesterol in the body, Cherry Green Tea can improve cardiovascular health in other ways, too. Reduced levels of nitric oxide (NO) in the endothelium lining of blood vessels is one of the leading causes of atherosclerosis, a chronic disease related to cardiovascular health. Flavonoids found in Gunpowder Green Tea, meanwhile, are believed to improve endothelial function and flow-mediated dilation (FMD). According to a study published in the American Journal of Clinical Nutrition, Gunpowder Green Tea improves bioactivity of the endothelium-derived vasodilator, (‘vasodilation’ refers to the widening of blood vessels) nitric oxide, by enhancing its synthesis. Furthermore, Cherry Green Tea should be considered for improving the immune system, especially when you’re already feeling under the weather. A 2007 study published in the Journal of American College of Nutrition has the proof. According to the published research paper, participants of the study were split into two groups, the first group of which consumed Green Tea capsules while the second group was given a placebo. Both groups were instructed to take either their Green Tea capsules or the placebo twice daily for three months. It was concluded that the Green Tea capsule group was 32% less likely to experience symptoms of cold or flu, while levels of illness-fighting gamma-delta T cells were also higher compared to the placebo group.